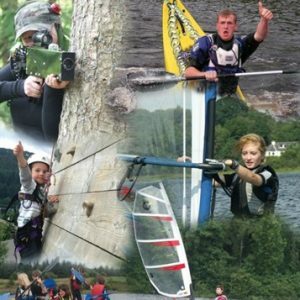 Situated on the bank of Loch Ken in south west Scotland, the Galloway Activity Centre caters for families, individuals and groupsalike. On site you will find the Waterfront Cafe which can seat over 100 people, serving delicious homemade baking. There is also the Clubhouse which can be hired for a wide range of functions. We welcome Corporate group meetings, Birthday Parties, Presentations, Weddings and anything else you can think of. At the Galloway Activity Centre we offer a wide range of wet activities.The fresh non-tidal waters of Loch Ken provide a fun and safe environment for a range of water sports. These include Sailing, Windsurfing, Powerboating, Kayaking, Canoeing and much more. On the dry side, chose from Outdoor Laser Quest, Climbing Wall, Zip Wire,Leap of faith, Jacobs Ladder, Tree Climb, Mountain Biking and Archery .Create your very own bespoke package with options from as short as a 1/4 day taster to week long multi activity course. There is a variety of accomodation ranging from our Bunkhouse Lodge which sleeps 20, our Loch Side Cabins which sleep between 2 - 6, for the more adventurous check out our Tipi (wigwam) and Mongolian Yurt, or there are Camping Pitches over looking the loch.